Home / Burn Fat - Business - durham gym - fatloss - fitness - Inspiration - RT Fitness / Your Goals or Theirs??? Why a good coach should never impose their own goals onto their clients. Exercise is a wonderful thing; one of the things that makes it so wonderful are the diverse reasons people have for doing it in the first place. These reasons are so varied that I couldn’t possibly list them all however; it’s safe to say that this seems to cause many coaches problems. You see non of these goals are inherently right or wrong in fact many might not even know what their own goal is. There is no correct reason to want to exercise. The problem that a lot of coaches have is that they themselves have very set reasons why they exercise and this becomes a problem when they try to impose those reasons on their clients. The only person that has any right to decide your goals is you. If you just want to exercise for fun or to socialise and your coach is constantly pressuring you to diet or lose weight then this will have a profound effect on your mental well being and will result in you stopping training all together or worse. 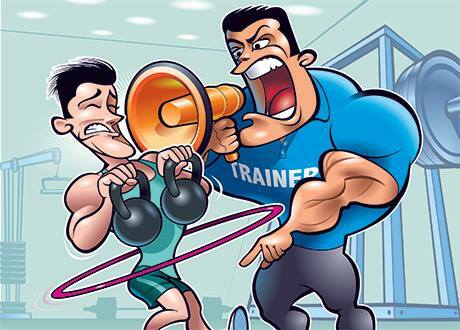 The only time a coach should intervene is if what your doing is putting your health at risk. This is one goal that almost everyone should share. The desire to get or at least remain physically healthy. The fact is, there’s no right or wrong way to look. Despite what my generation has been brain washed into believing nobody apart from you cares what you look like and it certainly doesn’t determine who you are. People have and always will be far more concerned with who you are as a person rather than what you look like. As far as aesthetics go it’s been found many times that when poled on which body type people prefer it’s almost alway an even split. This means that no matter what you look like your always going to very attractive or very unattractive to someone. This isn’t exclusive either it applies to everyone weather your 10%bf with abs or not. The fact that this happens often causes people to associate exercise solely with losing weight and this means that many many people who could massively benefit from exercise are put off. I mean when was the last time you seen a fitness page talking about how awesome their client is who hasn’t lost weight or lifted something massive but has in fact used exercise as a catalyst to overcome depression and or other psychological issues. Yeah, exactly. Like I said exercise is awesome but because of the short sightedness of those within the industry a lot of the good that can come from exercising goes missing because people aren’t given a chance to decide for themselves why they are doing what they are doing. Their pigeonholed into pre-set ideals of why someone should exercise. So, before you start exercising or looking for a coach or a gym have a good talk to yourself and decide what it is you really want out of it. Do you really want to lose or weight or get that 6 pack or are there deeper reasons making you think you want those things that could infect be better addressed still through exercise but without intimidating and imposing expectations placed upon you.